To be effective (improve quality) and efficient (reduce costs) the KPI's and Metrics that each of the call center stakeholders sees and reacts to should not be the same. This may seem like a very simplistic statement yet it is surprising how often call centers display the same content to agents as well as managers and even senior management. This month's newsletter explores what KPI's and Metrics each of the stakeholders should be seeing within the call center. Within each call center there are a minimum of four stakeholders: Agents, Team Leaders, Managers and Senior Management. Each of these stakeholders has a need for distinct information and different levels of detailed information. Agents require more information and statistics about how they are doing while a manager and senior management need to see information that covers the entire call center and business. 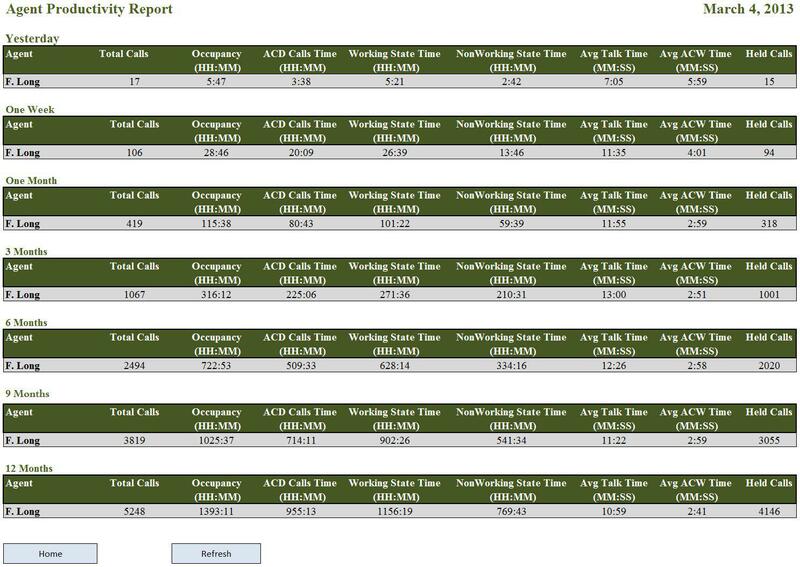 Furthermore agents need to see more real time information, with some notable exceptions such as calls for the day, service level for the day, and other similar types of ACD statistics. If the call center is a sales call center revenue statistics for the day would be required. There are many KPI’s that an agent may need to see based on the industry and business the contact represents. Inbound call statistics, outbound call statistics, trouble tickets, transferred calls, and abandoned calls are just a few of the KPI’s that agents may need to see. While an experienced agent wants to know how they are performing and see their weak spots so they are able to correct themselves. Too often contact centers give all agents the same desktop content which is too much for the new agents and the wrong content for the experienced agent. A manager or senior management needs to review information that is more historical. Certainly real time information is valuable; however, just looking at a singular point in time can be misleading to management. The information that each stakeholder should see and be aware of will change based on the business or industry of the contact center or help desk. 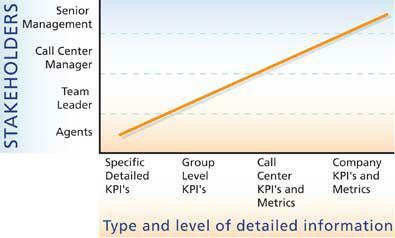 A sales call center would need to revenue, cross selling, up selling and other revenue or CRM related KPI's and Metrics. A Customer Service / Help Desk call center, internal or external, is interested in the number of tickets opened, closed, serviced, FCR, service level on the tickets and other similar types of KPI's and Metrics. Spectrum can help the call center manager determine which KPI's and Metrics might be the most important for their contact center. 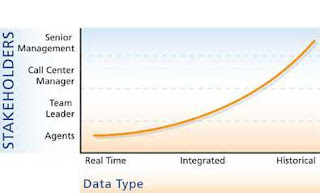 Agent information should be real time and not historical except when the data is accumulated for the day. Team Leaders should be viewing real time information throughout the week and then on a weekly basis reviewing the historical data for the groups and agents to determine how they are doing against company goals. During the day the team leaders should be reviewing the accumulated values on the KPI's and not just the real time values. 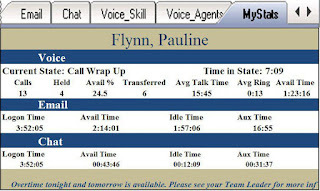 Supervisors not only help manage agents they also take calls. Their desktop information can and should be not only the group level but also their own statistics. Call Center Managers are responsible for the entire call center and multiple groups and team leaders. The managers require a high level of information on each group and less on the individual agents. However, drill down capabilities is critical so the manager is able to see which group is not meeting expectations according to goals previously set. The manager is more likely to need a dashboard rather than a simple desktop display. The dashboard will provide much more information as well as the ability to drill down into the information they require. Variances against the goals and the trends for the call center can be reviewed for goal setting and agent performance reviews. Call Center Managers should be reviewing real time and historical information throughout the day, week and month. These metrics should be compared against company goals and a trend analysis should be provided showing how the overall center is performing against goals and if possible benchmarked against industry peers. Managers today want to know how well the agent has performed but not just for the day they want history. 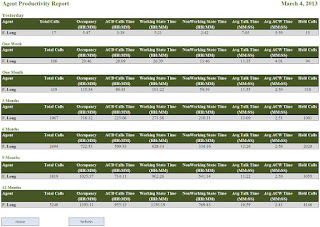 This example is a web based report about an agents performance over the last year. The working state time is a calculation of talk time + after call work time + idle time. The non working state time is a calculation including lunch, breaks, training, coaching, celebrations, vacations and other unavailable statistics. This report shows the manager how the agent has performed at different times of the year as the business conditions had changed. Senior Management typically does not have time, inclination or desire to know the intricate details of how the call center metrics are performing. The number of metrics that need to be reviewed and understood to grasp how the call center is doing would be overwhelming to most senior managers. The Call Center Manager needs to provide senior management a single set of values that will express to management how the call center is performing against goals and industry peers. A trend analysis showing the direction the call center is going supported by surveys and statistics is ideal for managers. Senior management and Managers also need this data to be mobile. The reports need to be viewed on tablets, web reports and smart phones. Managers may desire other information that is relevant to the business and industry included on this metrics report. It is incumbent upon the call center manager to determine what management requires and provide that information in a single easy to understand balanced scorecard. Spectrum is ideally situation to assist contact center managers with the seemingly daunting task of trying to capture the right information for the right audience. Spectrum is a leading provider of Unified Contact Center Reporting. 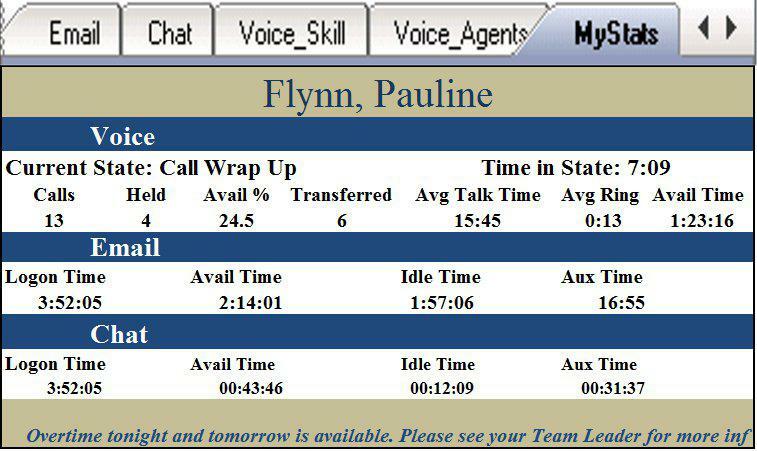 Contact Spectrum today to learn more about real time reporting for your contact center.